Goats are the new age trendy way to handle weeds opposed to traditional chemicals in community settings. 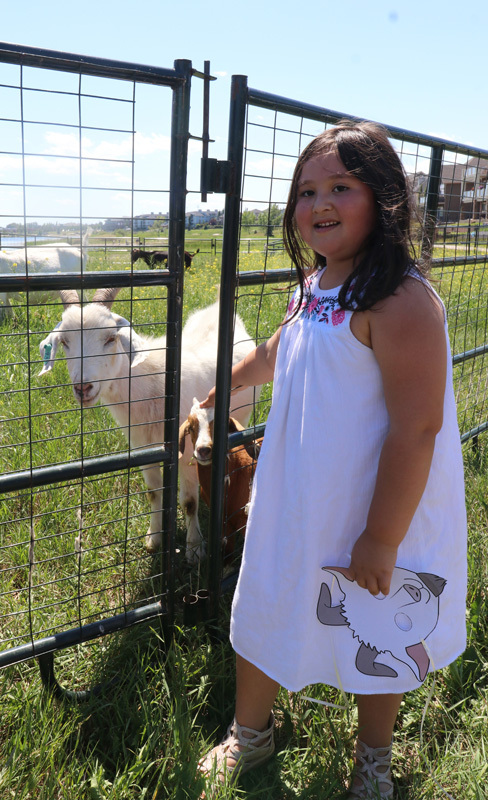 Approximately 375 goats roamed throughout Chestermere’s off leash dog park, clearing the site of weeds, while keeping animals and pedestrians safe from potentially harmful herbicides. 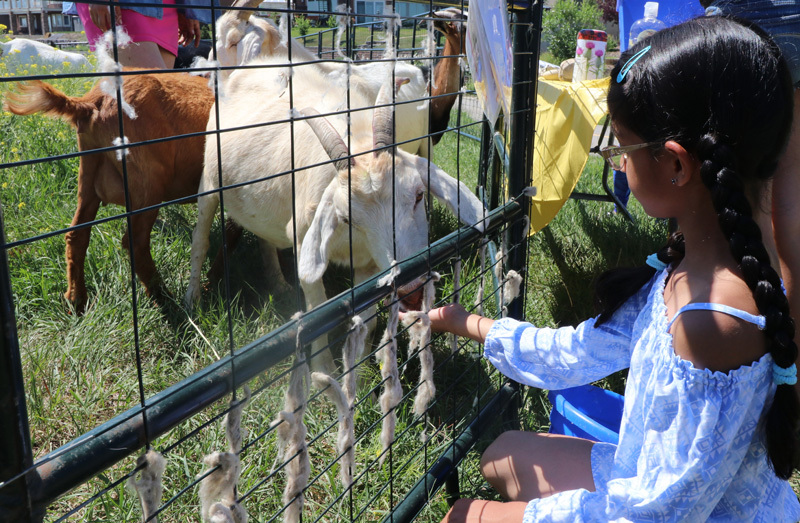 Goats are naturally great for weed control because they are browsers not grazers, Owner and Operator of BAAH’D Plant Management & Reclamation Jeannette Hall said. While goats consume weeds and broad leaf plants, their digestive system breaks down the plants seeds, so they are not just redistributing the seeds like other species, which makes the animals ideal for weed control. Hall said, since goats are top down grazers they eat the blossoming part and the seed producing part of the plant first. “If the plant keeps coming back year after year the goats will attack the root base, rip the leaves off, and really make that plant suffer,” Hall added, “Sometimes we have to treat the plant a number of times, but the goats are very good at that. The tribe of goats fertilizes the site as they go, and sometimes the goats Shepard may encourage them to bed down on a spot that is bear or where the soil is dead. “When they stand up they will start to revitalize those target areas,” Hall added, “Depending how we are managing the animals we can really influence the site. “I’m not saying that I’m against herbicides, I’m just saying that there’s a time and a place and working in a water way like Chestermere Lake it’s really great to not have to overload the ecosystem with those types of chemicals,” Hall said. The tribe of goats in Chestermere were Hall’s best trained. The herd goes to all high-profile sites, which are also the sites where there’s the most potential for things to go wrong. Including, people walking by, vehicles, water safety hazards, dogs off leash, wild life, and steep slopes. The herd knows where to go and what to do based off of Hall’s vocal cues. Hall added, she needed a lot of training and dedication to the goats, with limited exposure to dogs and the fence. Although caring for 1000 goats and 350 sheep in total can be challenging, Hall said getting to spend her time with the animals is the best part and makes the constant 24 hour shifts worth it. “I often compare myself to a new mom. I’m up every four hours checking on them, so if I seem exhausted to people, that’s why,” Hall said. “I’m up all the time, and you have to be. There’s a number of things that could go wrong at the drop of a hat, so you have to be vigilant,” she added. “I do this because I started to look at the carbon impact I had on the earth and I started to think about what my impact was regarding the materials I was purchasing and how I was living my life, that’s also why we live in a tiny house, and why we buy local. “We try to truly live and be the change we want to see in the world,” Hall said. Although Hall is not generating a high income from her passion, she is showcasing that there’s a different way to do things, and that we as a society don’t always have to default to one specific method of doing things. While working as an environmental consultant in the oil and gas industry three years ago, Hall would talk with countless frustrated land owners who needed their sites to be reclaimed from weeds. Hall would send numerous companies out to help the land owners, however, none of the sites reached reclamation status. “Most of the time the sites were getting write off or approved but it wasn’t because [the companies] did a good job reclaiming it- it was because the weeds had spread so far and damaged so much more land by that time the sites were infested with weeds,” Hall said. “To me that didn’t feel like that was were doing anyone any favours, and we needed a real solution,” she said. Hall began to feel for the organic land owners who might have an oil and gas lease on their property, and where there weren’t any options for weed control. “That’s where I thought this might be worthwhile,” she said. Hall added, although training goats for weed control is trendy right now, and she feels inspired by everyone who wants to follow suit, she does exercise caution with being very clear regarding expectations for who land owners hire. For additional information on weed control, or for a list of recommendations visit the BAAH’D Plant Management and Reclamation website at www.organicweedcontrol.ca.